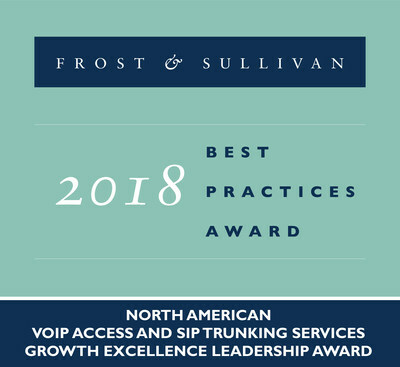 MONROE, La., Sept. 5, 2018 /PRNewswire/ -- Based on its recent analysis of the Voice over Internet Protocol (VoIP) access and Session Initiation Protocol (SIP) trunking services market, Frost & Sullivan recognized CenturyLink, Inc. (NYSE: CTL) with its 2018 Growth Excellence Leadership award. "With a comprehensive portfolio of services and the ability to create custom solutions to address varying business needs, CenturyLink has shown it can deliver the value its customers need and expect. We believe the provider remains well positioned for future growth," stated Michael Brandenburg, information and communication technologies analyst, Frost & Sullivan. Frost & Sullivan identified several factors driving CenturyLink's success, including significant growth in the VoIP access and SIP trunking services market through a highly effective merger strategy and carefully considered product integration approach. The company was also recognized for having one of the most diverse communications products and services portfolios in the industry. "This award recognition by Frost & Sullivan validates our efforts to deliver simple communications solutions with sophisticated capabilities that meet our customers ever-changing needs, all while maintaining a high level of service," said Thuy Ha, vice president, voice and real-time communications, CenturyLink. "We remain focused on helping our customers maximize their current IT investments, while identifying opportunities to integrate new technologies that can help improve operational effectiveness and support the evolving needs of an increasingly agile workforce." CenturyLink offers a wide range of communications solutions including business VoIP, UCaaS, SIP trunking, hosted contact center offerings and a full range of UC&C services. CenturyLink received Frost & Sullivan's 2016 North American Hosted IP Telephony and UCaaS Growth Excellence Leadership award, as well as the Product Line Strategy Leadership award for VoIP access and SIP trunking in 2015 and 2016 (as Level 3 Communications).